This scarf was made by cutting a piece of prefelt slightly smaller than the width and lenght of the habotai scarf. The prefelt is placed on top of the scarf streching slightly to fit the width of the scarf. This scarf was made by felting the base until it was about 13" wide. Then the prefelt shapes were placed on the base and felted into place. The prefelt shapes are added near the end of the felting stage to minimize distorting the shapes. 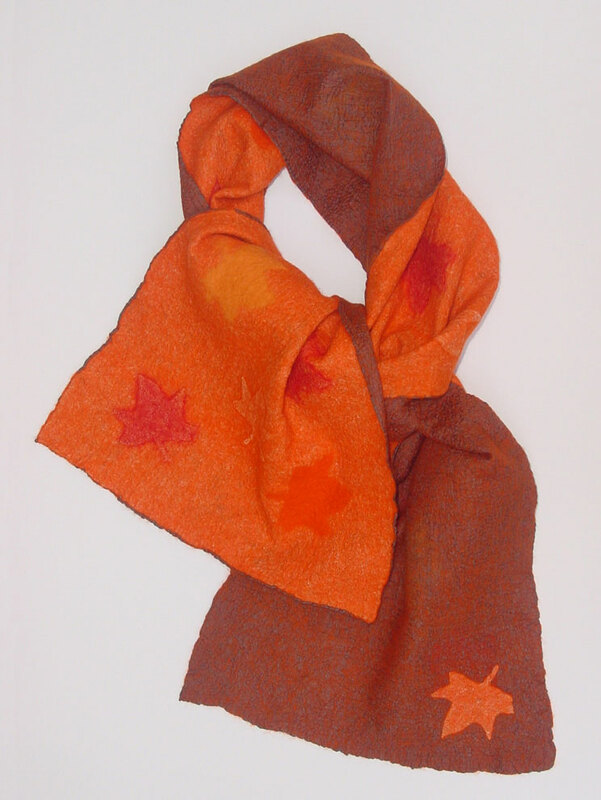 The scarf was felted with a sander, fulled by folding and dropping, and finished by rubbing on a glass washboard. Finished size: ~ 11 1/2" x 61"